Britain's Prime Minister Theresa May leaves 10 Downing Street, in London Monday, Dec. 17, 2018, for the House of Commons to make a statement on the EU Summit held recently in Brussels. 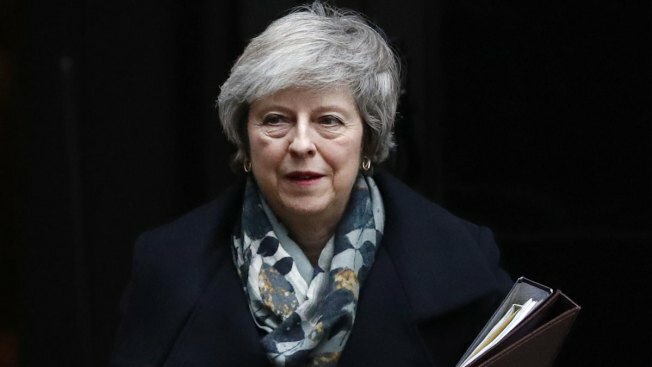 Prime Minister Theresa May said Monday that the postponed vote in Parliament on Britain's Brexit agreement with the European Union will be held the week of Jan. 14 — more than a month after it was originally scheduled and just 10 weeks before Britain leaves the EU. But even as May insisted she could salvage her unpopular divorce deal, pressure was mounting for dramatic action — a new referendum or a vote among lawmakers — to find a way out of Britain's Brexit impasse and prevent the economic damage of a messy exit from the EU on March 29 with no agreement in place. Jeremy Corbyn, leader of the main opposition Labour Party, said he would submit a motion of no-confidence in the prime minister over her delays. Losing the vote on such a motion would increase the pressure on May, but unlike a no-confidence vote in the government as a whole it wouldn't trigger a process leading to the fall of the government and an early election. She tried to win changes from the EU to sweeten the deal for reluctant lawmakers, but was rebuffed by the bloc at a summit in Brussels last week. May's authority also has been shaken after a no-confidence vote from her own party on Wednesday that saw more than a third of Conservative lawmakers vote against her. "I know this is not everyone's perfect deal," May said. "It is a compromise. But if we let the perfect be the enemy of the good then we risk leaving the EU with no deal." 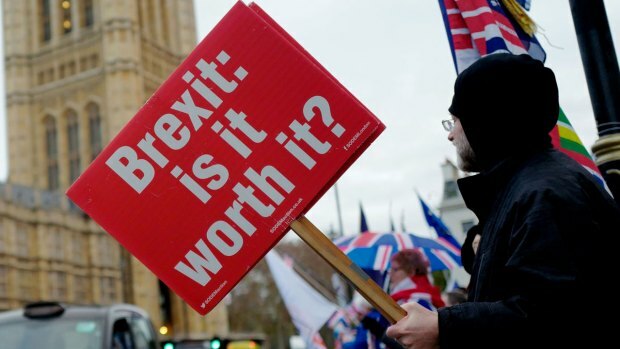 Opposition legislators — and many from May's Conservative Party — remain opposed to the deal, and accused May of deliberately wasting time by delaying the vote for several more weeks. "The prime minister has cynically run down the clock trying to maneuver Parliament into a choice between two unacceptable outcomes: her deal and no deal," Corbyn said. But May told lawmakers that staging another referendum would ride roughshod over voters' 2016 decision to leave the EU and "would say to millions who trusted in democracy that our democracy does not deliver." May's deal is loathed both by pro-Brexit lawmakers, who think it keeps Britain bound too closely to the bloc, and pro-Europeans, who see it as inferior to staying in the EU. The main concern for pro-Brexit lawmakers is a contentious insurance policy known as the "backstop," which would keep the U.K. tied to EU customs rules in order to guarantee the border between Ireland and Northern Ireland remains open after Brexit. EU officials insisted at last week's summit that the withdrawal agreement cannot be renegotiated, although they also stressed that the backstop was meant only as a temporary measure of last resort. 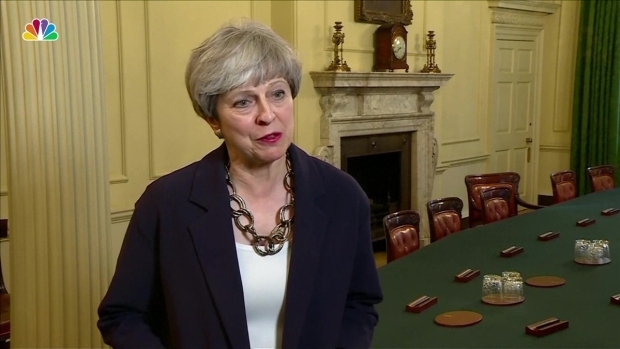 May said she had had "robust" exchanges with other EU leaders in Brussels, but that the two sides were still holding talks about "further political and legal assurances" about the backstop. European Commission chief spokesman Margaritis Schinas, however, said Monday that "at this stage, no further meetings with the United Kingdom are foreseen." With Britain's departure from the bloc just three months away, it remains unclear whether the country will leave with a deal or crash out with no deal— a chaotic outcome that could see economic recession, gridlock at U.K. ports, planes grounded and shortages of essential goods. The Cabinet will discuss "no-deal" planning at its weekly meeting on Tuesday, with details to be announced soon of 2 billion pounds ($2.5 billion) in government funding to absorb some of the potential economic shock. May's spokesman, James Slack, said Monday that the government had "no plans" to hold such an indicative vote. But the idea has support in Cabinet. He said that "I think businesses up and down the country would expect elected members to take responsibility, rather than just be critics."